JACKSON, Mich., Apr. 03 /CSRwire/ - As leaves and green grass begin sprouting across the state, many Michiganders are planning outdoor digging such as landscaping projects and other home improvements. Dig Safely Month is designed to remind residents and excavators to take safe digging measures with every project, large or small. "Safety is always our top priority. It doesn’t matter if the equipment used is a shovel, rototiller, auger or large earth-moving equipment, MISS DIG 811 should always be contacted first so underground utilities can be marked, and practicing safe digging procedures should follow,” said Garrick Rochow, senior vice president of operations for Consumers Energy. “We appreciate the support from Gov. Gretchen Whitmer, MISS DIG 811 and other safe digging partners as we continue to emphasize to contact MISS DIG before a digging project begins. 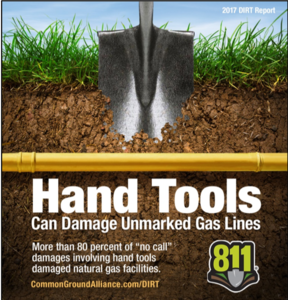 In 2018 the total number of homeowner damages to Consumers Energy natural gas and electric lines was down 6 percent; however, the biggest reason damages continue to occur is because MISS DIG 811 wasn’t contacted before digging began. A total of 278 damages by residents occurred in 2018, down from 296 in 2017. The biggest increase in residential damages was due to fencing installation, though landscaping projects are also high on the damage list. “I remind all Michiganders as you move into spring and begin excavation projects to contact MISS DIG 811 to protect the safety of those digging as well as the many utilities located underground. Keep yourself, your neighbors and underground utilities safe, contact MISS DIG before you dig,” said Bruce Campbell, CEO of MISS DIG System Inc.